Are you lucky enough to be teaching teens? 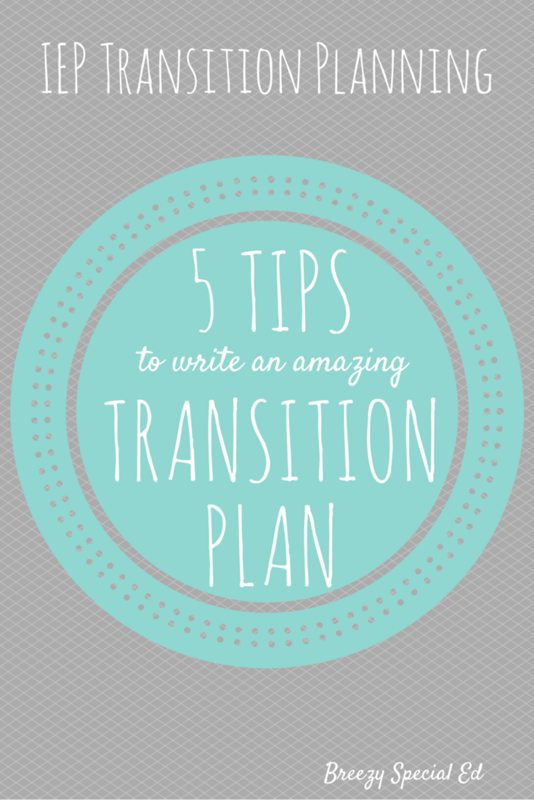 Then you are lucky enough to write a transition plan! In Illinois, all students must have a transition plan in their IEP by the time they are 14 and a half. So, unless you want to hold another meeting at the student's 14 and a 1/2 birthday, you will want to include the transition plan anytime in that year before it is required. For all transition plans, a student needs to have an education OR training goal (and they can have both), an employment goal, and an independent living goal. Also, we need to be thinking and writing about what this student will be doing AFTER high school (even if that's still 8 years away). 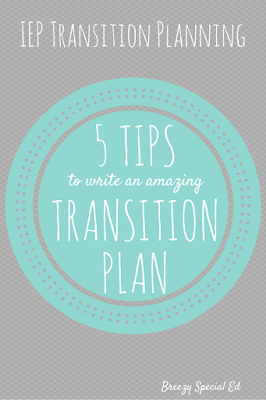 Here's a few tips to make sure your transition plan is compliant. 1. Use "will" statements and be specific. "After completing high school, Becca will work in the community with support." First, when will this happen? Well that would be after high school, so every transition outcome should start with that phrase. You also want to make sure you are using will statements, this way it gives a clear picture of what we expect to happen and is easily measurable. You should not say something like, "Becca would like to work in the community with support." This is not a goal but rather a nice thought. It has no way of being measured and does not give a clear picture of where we expect Becca to be after high school. Finally, be specific - what kind of job will it be? What kinds of supports will be needed? Let whoever is reading your transition plan get an idea of the needs and supports this student will need. 2. Include student and parent assessments. If you have higher level students who are good readers, there are a ton of various assessments and surveys. Check out this huge list here and even more here. Keep a summary of all assessments in the IEP, so they can be compared to year from year. 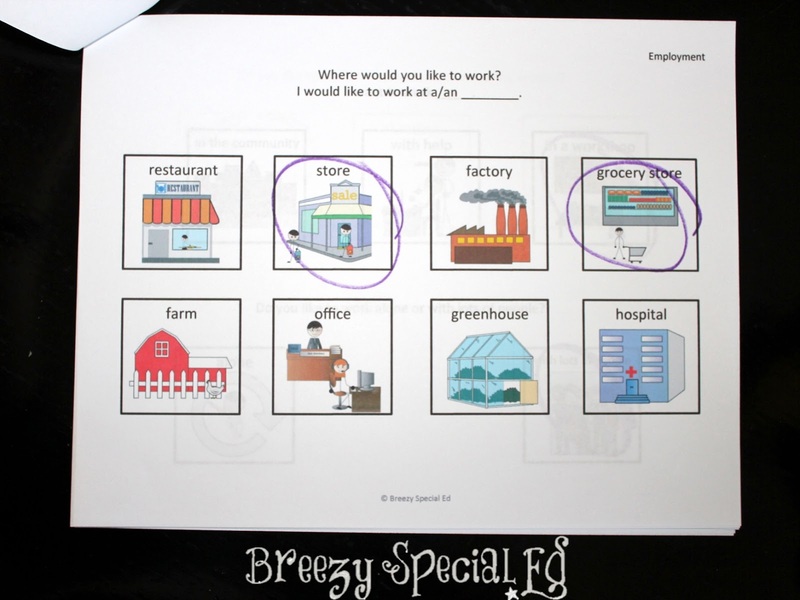 In addition to these assessments, include your personal reflection of the student's strengths as well, such as Mark works well with computers. 3. State what the student needs to be successful. In the Transition Needs, Services, and Goals section you need to state exactly what that student needs to be successful. For example, in the instruction section, I would include something like this "Megan needs a structured program in order to stay on task. Megan will need to communicate her wants and needs. Megan will need to reduce the amount of support needed to complete a task or assignment. Megan also needs to improve her skills related to functional mathematics and language arts to assist her in preparing for post-secondary outcomes." Don't forget, your goals need to link to these areas so that you can prove that you are working on these things that your student needs to improve. 4. Prepare the student for their transition goals. If your student tells you they want to be a basketball star, you better show in the IEP that you are giving them opportunities to prepare them for that goal (the Course of Study in the transition plan is a great place for this). For example, to prepare them to be the next Michael Jordan, make sure they are in PE classes and have opportunities to participate in school sports, such as Special Olympics. We don't have to guarantee that their goals will happen, but we do have to show that we are helping them get there. You won't believe how many parents say their child is going to live with them forever. The truth is, most children outlive their parents (not to mention that, with or without a disability, many students don't WANT to live with their parents forever). So many of my independent living goals sound something like this, "After high school, Paul will live with his parents and eventually move into some sort of supported living environment." This statement acknowledges that the parents want their child to live at home with them, but also that we recognize the need to prepare them to live successfully with other individuals as well. Hope that helps. Let me know if you have any questions! Happy transition planning!